There are plenty of reasons to hide a Blink Home Security Camera System. Most obvious is that you don’t want any bad guys to see it. 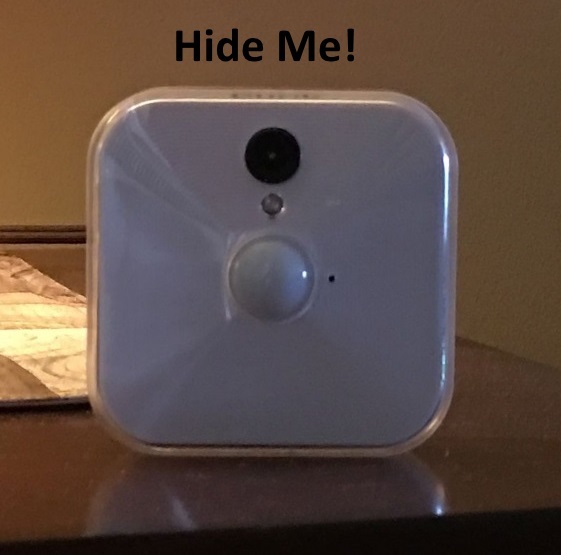 In this article, we will take a look at a few places and methods to hide a Blink home security camera. To hide a Blink home security camera is going to take some changes in behavior plus some additional camouflage. Here are two suggestions. First, don’t ever use the night vision. Although technically, the Blink camera doesn’t have traditional night vision. Whatever it is, don’t use it. Most home security cameras deploy IR lights for night vision. The Blink camera use an extremely bright LED light. It’s like pointing a bright flash light into the subject’s face. You might as well tell them where the camera is located if you use this light. Just don’t use it. Secondly is the presence of the status indicator light. Cover it with some Duct Tape. This light comes on every time the camera is in live mode. Can’t turn that off so cover it up. Now that we have covered those important points, let’s look at some clever ways to hide a Blink home security camera. The Blink cameras have a nice wide 110 degree lens. It’s made to see most of the room from a corner shelf. Keep the Blink camera on a corner shelf with a bunch of keepsakes surrounding it. It’s hard to see it. Especially if you have that status indicator covered and don’t use the night vision. I find that placing it away from a counter or table where it is out of the open is the first step in hiding a Blink camera. Fake plants make for good camouflage. Plant your Blink camera inside a fake plant. Be sure the leaves do not get in the way of the wide angle lens. Everybody has a fake plant, so try this method out. One of my favorite ways to hide a Blink camera is inside a tissue box. The Blink is a small camera. I like using a tall box of Kleenex tissues. Remove all the tissues. Cut a small hole to line up with the Blink camera lens placement. Put the Blink in the box, use some tape to keep it in place. Put the tissues back in the box. A tissue box with an elaborate design is going to mask the little hole fairly effectively. Most have one of these boxes of Kleenex tissues in their home already. So more than likely, it’s a free hiding place. You can also deploy some mounting accessories to hold your Blink home security camera in places people aren’t expecting to find it. That’s where the Arkon Tripod Mount for Smartphones comes in. Yes, it’s a smartphone mount but remember, the Blink camera is only 2.3 inches wide and has a flat back. It’s going to fit perfectly within this mount. I like this tripod stand a lot because of it’s flexible legs. Sure, you can use it like a traditional tripod, but that isn’t going to hide the camera. The unique thing about this stand is the flexible legs. They wrap around stuff. Like a rail or post or chair leg. You get the idea. Put it in a place that a potential intruder would not look. I like the idea of placing it under a chair pointing upwards. Don’t forget that the Blink camera comes with a mounting bracket so you can also attach it to any flat surface such as a wall. The challenge is going to be how to keep it out of plain view. However, similar to the chair leg idea, you can also attach this to a wall under a shelf. The primary idea behind a home security camera is to catch someone in the act so that you can hopefully stop them or at least catch them. Using these idea to hide a Blink home security camera should help you to pull that off.